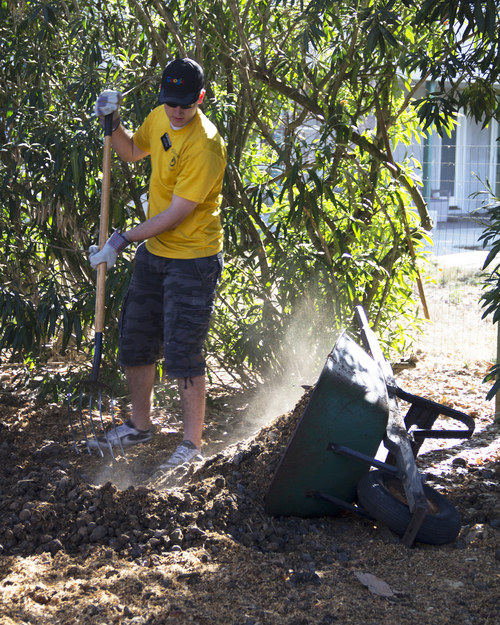 LDS • Bay Area elders and sisters are spending their days helping area nonprofits. | Courtesy Elizabeth Fuchs Elder Thomas, of Highland, Utah, left, and Elder Gorbahn, of Smithers, Canada, help serve the homeless at Our Daily Bread in Sunnyvale, Calif. Two Mormon missionaries in the San Jose, Calif. mission -- Elder Whitehead in yellow hat from Cedar Hills, Utah and Elder Pehrson in green from Rapid City, SD -- help out in an orchard. Courtesy Elizabeth Fuchs Two Mormon missionaries in the San Jose, Calif. mission -- Elder Whitehead in yellow hat from Cedar Hills, Utah and Elder Pehrson in green from Rapid City, SD -- help out in an orchard. Courtesy Elizabeth Fuchs Two Mormon missionaries in the San Jose, Calif. mission -- Elder Whitehead in yellow hat from Cedar Hills, Utah and Elder Pehrson in green from Rapid City, SD -- help out in an orchard. Courtesy Elizabeth Fuchs | Courtesy Elizabeth Fuchs Elder Pehrson, of Rapid City, South Dakota, helps serve the homeless at Our Daily Bread in Sunnyvale, Calif. | Courtesy Elizabeth Fuchs Elder Gorbahn, of Smithers, Canada, left, and Elder Thomas, of Highland, Utah, help serve the homeless at Our Daily Bread in Sunnyvale, Calif. | Courtesy Elizabeth Fuchs Elder Pehrson, of Rapid City, South Dakota, left and Elder Whitehead, of Cedar Hills, Utah help serve the homeless at Our Daily Bread in Sunnyvale, Calif. | Courtesy Debbie Torrens LDS missionaries getting ready to clean up trash and remove graffiti along Keyes Street, a main thoroughfare impacted by a homeless encampment (one of the largest in the nation) named "The Jungle." | Courtesy Elizabeth Fuchs Elder Whitehead, of Cedar Hills, Utah, helps serve the homeless at Our Daily Bread in Sunnyvale, Calif. | Courtesy Elizabeth Fuchs Elder Thomas, of Highland, Utah, helps serve the homeless at Our Daily Bread in Sunnyvale, Calif. | Courtesy Elizabeth Fuchs Elder Pehrson, of Rapid City, South Dakota, left, and Elder Whitehead, of Cedar Hills, Utah, help serve the homeless at Our Daily Bread in Sunnyvale, Calif. | Courtesy Chad Le Beau Caption: Elder Chad Le Beau, a Mormon missionary serving in the San Jose LDS mission, helps interpret for Paul Kalff at the California School for the Deaf. | Courtesy Elizabeth Fuchs Elder Thomas, of Highland, Utah, left, and Elder Gorbahn, of Smithers, Canada, help serve the homeless at Our Daily Bread in Sunnyvale, Calif. Two Mormon missionaries in the San Jose, Calif. mission -- Elder Whitehead in yellow hat from Cedar Hills, Utah and Elder Pehrson in green from Rapid City, SD -- help out in an orchard. Courtesy Elizabeth Fuchs | Courtesy Elizabeth Fuchs Elder Gorbahn, of Smithers, Canada, left, and Elder Thomas, of Highland, Utah, help serve the homeless at Our Daily Bread in Sunnyvale, Calif. 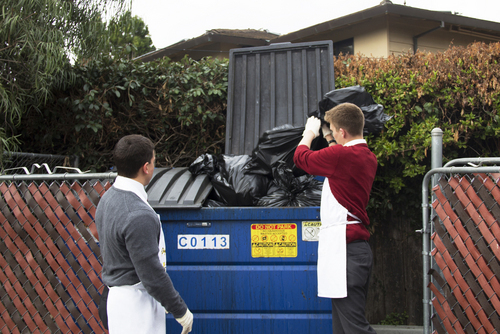 In Northern California, the image of Mormon missionaries in dark suits and white shirts, knocking on doors at inconvenient times, is being replaced by the sight of these name-tag-wearing twosomes in blue jeans and T-shirts, hoeing gardens, scrubbing off graffiti, dishing out food in homeless shelters and reading with refugees. It&apos;s part of the LDS Church&apos;s recognition that its long-held practice of "tracting," going door to door handing out church materials and delivering religious messages, is no longer effective. Now few people are home during the late morning and early afternoon, and those who are may not want to be disturbed. "The world has changed," LDS apostle L. Tom Perry said in June 2013. "The nature of missionary work must change if the Lord will accomplish his work." People today, he added, are often "less willing to let strangers into their homes." The LDS San Jose Mission already had discontinued tracting. Mission leaders got the word three years ago from church headquarters in Salt Lake City: Find something else for these eager, young full-time missionaries to do. And it&apos;s not about baptizing. 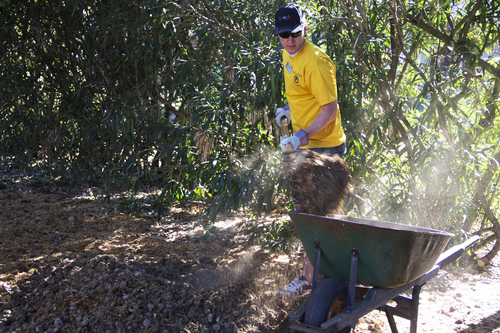 So San Jose leaders proposed that missionaries provide two hours of nonproselytizing community service every day, five days a week  up from the normal four or so hours a week. This meant that Mormons would have to build partnerships with charitable organizations in their area that might need regular volunteers. With the help of Web designers in Utah, LDS public-affairs officials in San Jose created a website called justserve.org, which lists organizations with service opportunities. "We met with a lot of nonprofit organizations," explains Randy Mack, an accountant and regional LDS public-affairs co-director with his wife, Pat. "We said, &apos;Here&apos;s what we are doing. 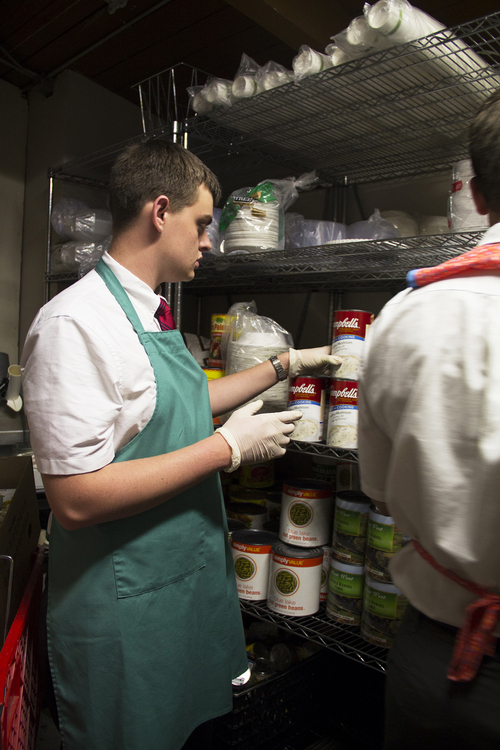 If you have anything we could do, let us put these projects on our website.&apos; "
The Mormon missionaries have taken to their new assignments with relish, he says. "Because of their being involved with service, people love the missionaries. They are welcomed and get very positive responses  a much different response than knocking on doors." 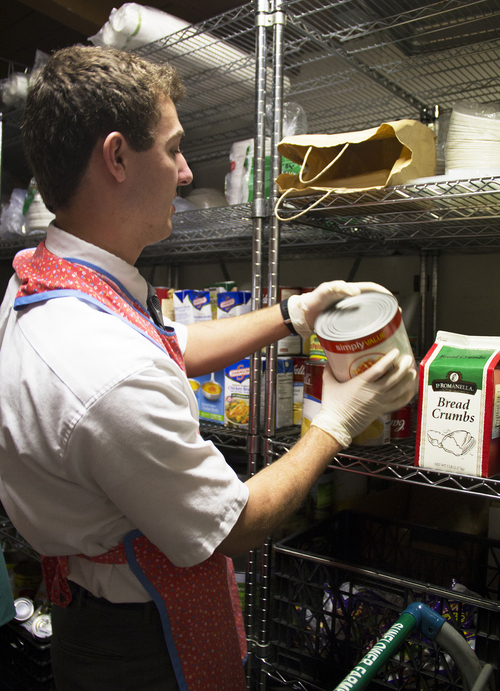 On top of that, they have more meaningful ways to fill those daytime hours, Mack says. In addition, missionaries are less likely to have health problems or depression, and relationships between the pairs known as "companionships" have improved. "It&apos;s all been very positive," he says. "The mission president is really excited about it." The San Jose initiative was a pilot program, but was followed about a year ago in Dallas and Denver. 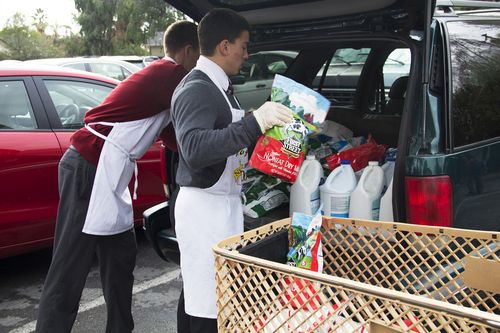 Others are urging that all Mormon missionaries perform extra community service. 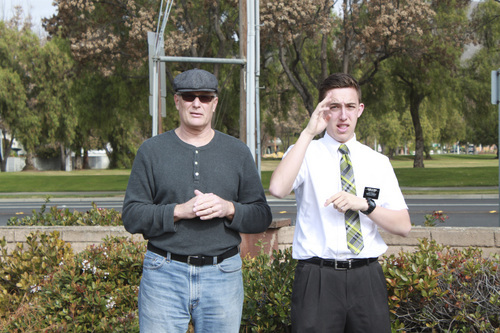 Elder Chad Le Beau,18, of Peoria, Ariz., has been in the Bay Area for about seven months, as an American Sign Language missionary (both his parents are deaf). 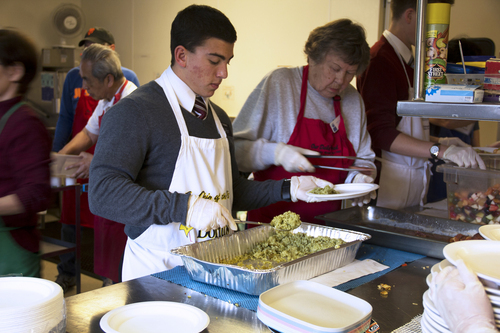 He and his companion spend a lot of his service hours helping out at the California School for the Deaf in Fremont. "We volunteer at homecoming events, set up parking, cook hamburgers for everybody and help out at basketball games  keeping score, working the shot clock and interpreting for the refs," Le Beau says in a phone interview. "I love service. It builds friendships and love that cannot be obtained through any other means." Le Beau enjoys this part of his mission a lot. "Being able to help someone and noticing that you&apos;ve made a difference," he says, "I don&apos;t see how you could not feel good about that." Other missionaries are helping with an after-school program in a low-income area in East San Jose, which serves kids who are at high risk for joining gangs, says September Higham, an LDS Relief Society president in Mountain View, Calif. They "hang out with the kids, play handball, help with homework and provide other mentoring services." This organization reached out to the missionaries in particular, Higham says, "because they had trouble finding volunteers who were available between 3 and 5 in the afternoon." 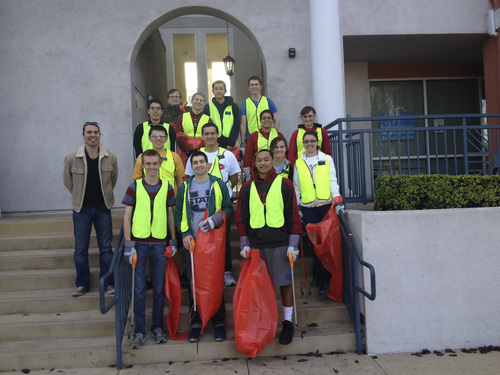 These young Mormons also help a neighborhood association clean up trash around the so-called "Jungle," a large homeless encampment in San Jose and one of the biggest in the nation. 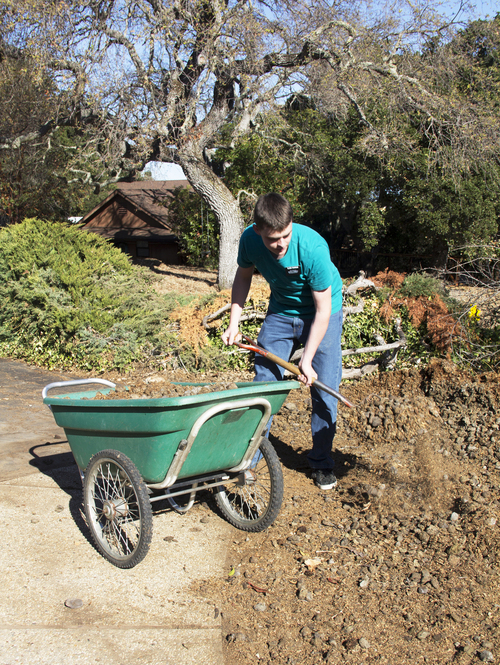 About six to 12 missionaries clean out cow stalls and chicken coops, put in irrigation systems, and weed and mulch once a week at Hidden Villa, a nonprofit educational organization, Higham says. 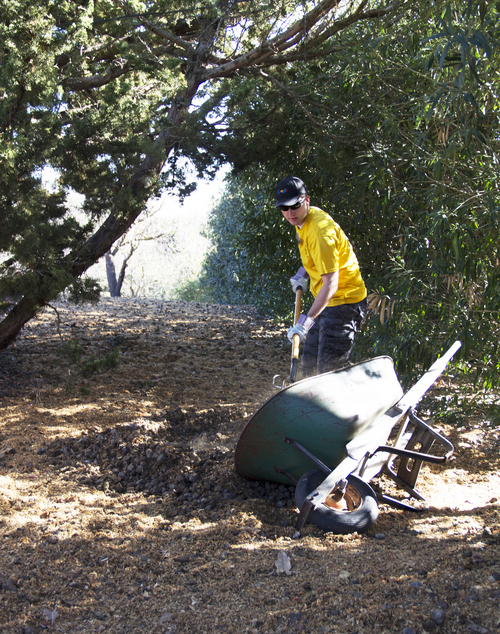 Another 15 missionaries work several times a week for a wildlife-habitat-restoration group called Acterra, removing invasive plants, planting native species and providing other services. "The missionaries were recently honored at the [Acterra] organization&apos;s volunteer dinner as the &apos;largest core group&apos; of volunteers," she says. • The service has to be within or near their assigned areas. • Missionaries are not allowed to use power tools and can go only four steps up a ladder. • Missionaries always must be within sight and sound of their companions. • Missionaries always have to wear their name tags. When evaluating service prospects, missionaries are told "to use good judgment and protect the name of Christ." Higham celebrates this move toward putting more service in Mormon missions. "We&apos;re sending a whole generation of young missionaries back home with the awareness and the experience to engage in service in their own communities," she says. "Some of these missionaries will become community leaders and the experience they gained at age 19 or 20 working with the homeless, at-risk youth, disabled individuals and other disadvantaged populations will become invaluable." And there&apos;s still plenty of time in the evenings to seek baptisms.